Applicants must hold a Ph.D. in an engineering or related field and will be expected to establish a strong, independent, multidisciplinary, and internationally recognized research program. Commitment to teaching excellence at the undergraduate and graduate levels is required. Applicants at the Assistant Professor level should submit their application online at http://apply.interfolio.com/56275; applicants at the Associate and Full Professor level should submit at http://apply.interfolio.com/56276. Applicants should include a cover letter describing their principal expertise, a statement of teaching and research interests and experiences, a complete resume and a publication list. Assistant Professor applicants are required to provide names of 3–4 references with email addresses. For additional questions, please contact the search committee at BMEDataScienceSearch@jhu.edu. Review of applications will begin on October 15, 2018, and will continue until the positions are filled. For full consideration, completed applications must be received by December 15, 2018. 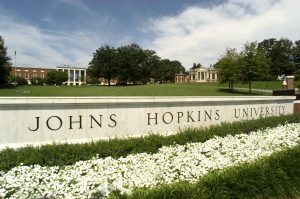 The Department of Biomedical Engineering at Johns Hopkins University invites applications for a tenure-track faculty position in Genomics or Epigenomics. Outstanding candidates at all academic ranks will be considered. The successful candidate is expected to perform fundamental research in experimental or computational genomics, epigenomics, or genome engineering. Relevant research areas of interest include, but are not limited to, genome sequencing technology, epigenetic editing, computational biology, bioinformatics, and synthetic biology. Faculty members have numerous opportunities for interactions across many centers and institutes, including the Institute for Data Intensive Engineering and Science, the Center for Epigenetics, the Mathematical Institute for Data Science, the Institute for Computational Medicine, the Institute for NanoBioTechnology, the McKusick-Nathans Institute of Genetic Medicine, the Malone Center for Engineering in Healthcare, the Center for Computational Biology, and numerous departments including Computer Science, Chemical and Biomolecular Engineering, Biostatistics, Biology, Electrical and Computer Engineering, and Medicine. Applicants must hold a Ph.D. in engineering, genomics/genetics, or another relevant field, and will be expected to establish a strong, independent, and internationally recognized research program. Commitment to teaching excellence at the undergraduate and graduate levels is required. Applicants at the Assistant Professor level should submit their application online at http://apply.interfolio.com/56277; applicants at the Associate and Full Professor level should submit at http://apply.interfolio.com/56278. Applicants should include a cover letter describing their principal expertise, a statement of teaching and research interests and experiences, a complete resume and a publication list. Assistant Professor applicants are required to provide names of 3–4 references with email addresses. For additional questions, please contact the search committee at BMEGenomicsSearch@jhu.edu. Review of applications will begin on October 15, 2018, and will continue until the positions are filled. For full consideration, completed applications must be received by December 15, 2018. The Department of Biomedical Engineering at The Johns Hopkins University invites applications for a tenure-track faculty position in Neuroengineering and Systems Neuroscience. Outstanding candidates at all academic ranks will be considered. The successful candidate is expected to have a track record of academic excellence, and research productivity, performing fundamental experimental, computational, theoretical, and/ or quantitative research aimed at furthering our understanding of brain function in both health and disease. Research areas of interest include, but are not limited to, the application and development of pioneering techniques and technologies for interfacing with and manipulating the nervous system, as well as computational, data, and theory driven approaches to improving the classification of brain organization, neurological disorders, and treatment outcomes. Opportunities for interactions across the University include the Kavli Neuroscience Discovery Institute, Mathematical Institute for Data Science, the Institute for Data Intensive Engineering and Science, the Center for Imaging Science, the Institute for Computational Medicine, the Malone Center for Engineering in Healthcare, the Laboratory for Computational Sensing and Robotics, the Center for Hearing and Balance, the Johns Hopkins Applied Physics Laboratory, the Kennedy Krieger Institute, and numerous Departments such as Electrical and Computer Engineering, Neuroscience, Psychological and Brain Sciences, Neurology, Psychiatry, Surgery, and Radiology. All applicants must hold a Ph.D. in an engineering, neuroscience or related field and will be expected to establish a strong, independent, multidisciplinary, and internationally recognized research program. Commitment to teaching excellence at the undergraduate and graduate levels is required. Applicants at all ranks will be considered. Applicants at the Assistant Professor level should submit their application online at http://apply.interfolio.com/56284; applicants at the Associate and Full Professor level should submit at http://apply.interfolio.com/56285. Applicants should include a cover letter describing their principal expertise, a statement of teaching and research interests and experiences, a complete resume and a publication list. Assistant Professor applicants are required to provide names of 3–4 references with email addresses. For additional questions, please contact the search committee at BMENeuroEngSearch@jhu.edu. Review of applications will begin on October 15, 2018, and will continue until the positions are filled. For full consideration, completed applications must be received by December 15, 2018. The Johns Hopkins University Department of Biomedical Engineering is seeking a creative and motivated individual for Lecturer, a teaching track faculty position in the Whiting School of Engineering. This is a career-oriented, renewable appointment that is responsible for the development and delivery of courses primarily to BME undergraduate students. These positions typically carry a course load of 3 courses per semester. Teaching faculty are also encouraged to engage in departmental and university service and may have advising responsibilities. Opportunities to teach graduate level courses will depend on the candidate’s background. Specific responsibilities include: instructing Freshman BME students in the introductory programming course Gateway Computing; providing daily support for BME students in their quantitative courses; managing a team of BME peer to peer student mentors; providing lectures as needed in the BME focus area elective course Introduction to Computational Medicine. Due to the collaborative nature of this position, there will be opportunities to participate in and contribute to other BME programs and initiatives. Applicants for the position should have: a Ph.D. in Biomedical Engineering or a closely related field; knowledge of systems and control theory, signal processing, image processing; demonstrated excellence in and commitment to teaching; excellent communication and interpersonal skills; knowledge of the Python programming language and extensive general experience in programming. All applications are to be submitted online at http://apply.interfolio.com/57067. Applications should include a cover letter, CV, statement of teaching philosophy, and at least three letters of recommendation. Review of applications will begin on November 15, 2018 and will continue until the position is filled. For full consideration, completed applications must be received by December 15, 2018. The Department of Bioengineering at the University of California, Riverside (UCR) (http://www.bioeng.ucr.edu/) invites applications for a tenure-track or a tenured faculty position beginning the 2019/20 academic year. While we are especially interested in the areas of neuro-engineering, imaging, and cellular and molecular engineering, exceptional candidates in other areas of Bioengineering will be considered. We are mainly interested in applicants at the Assistant Professor level; however, senior applicants at the Associate or Full Professor levels will be considered. The department is currently home to 17 core faculty members. Its interdisciplinary research and educational training effort extends through the Bioengineering Interdepartmental Graduate (BIG) Program, which encompasses 50 additional UCR faculty members. The department offers BS, BS/MS, MS, and PhD degrees, with a current enrollment of approximately 60 graduate and 350 undergraduate students. Our graduate program is a gender-balanced blend of US and international students, with two-thirds of the PhD students being domestic, and of those, one-fourth are underrepresented minorities. The BS degree program in Bioengineering is fully accredited by ABET since 2011. Full Consideration will be given to applications received by December 21, 2018. Applications will continue to be received until the positions are filled. A doctoral degree in a relevant engineering discipline or closely related field is required at the start of service. Candidates are expected to develop externally-funded research programs. Commitment to teaching and advising undergraduate and graduate students is essential. Salary is commensurate with education and experience. Notably, individuals from underrepresented groups are encouraged to apply. To Apply: Please register through the link https://aprecruit.ucr.edu/apply/JPF00977 (Assistant Professor) or https://aprecruit.ucr.edu/apply/JPF00978 (Associate/Full Professor) and provide a cover letter, full curriculum vitae, statement of diversity, statement of research, statement of teaching interests, and contact information for 3-5 references. UCR is a world-class research university with an exceptionally diverse undergraduate student body. Its mission explicitly states the goal of providing routes to educational success for underrepresented and first-generation college students. A commitment to this mission is a preferred qualification. The Department of Biomedical Engineering at The University of Iowa invites applications for a tenure-track faculty member at the rank of assistant or associate professor in the general area of computational healthcare. This position will begin in August 2019. This position requires a PhD in Biomedical Engineering or a closely related field. The successful candidate will have expertise in the use of biomedical signal/image processing, artificial intelligence, and/or health informatics toward predictive modeling of disease. Required qualifications include a strong commitment to effective teaching and mentoring students in the area of biomedical engineering, the potential to develop an internationally recognized research program, excellent communication skills, and a commitment to work towards a welcoming and inclusive environment. Desirable skills include a previous record of development of systems for healthcare decision making, evidence of interdisciplinary collaboration in a healthcare setting, and a strong track record of peer-reviewed dissemination of research. Candidates may find the BIRCWH (Building Interdisciplinary Research Careers in Women’s Health) training program, and multi-institutional centers such the Louisiana Clinical and Translational Science Center (LACATS), the Louisiana Cancer Research Consortium, and the Delta Clinical and Translational Health Disparities Consortium to be of particular interest because of their regional focus on cancer, cardiovascular disease, diabetes, and obesity, which are medical issues that are of critical importance to areas with high concentrations of poverty and low access to health care. These resources facilitate translational BME investigations in healthcare quality, availability, cost, or disparity that are applicable to our global community. Superb opportunities for collaboration exist within the School of Science and Engineering and Tulane’s Schools of Medicine, Public Health and Tropical Medicine, and the National Primate Research Center. Interdisciplinary centers include the Tulane Brain Institute, the Center for Aging, and the Interdisciplinary Bioinnovation Program. Our city also boasts the new University Medical Center and Veterans Administration Hospital. Forbes magazine ranks New Orleans as a top “brain magnet” city in the nation, with a burgeoning biotechnology entrepreneurial ecosystem. Tulane University is an AAU private university with a Carnegie classification as an institution with the Highest Research Activity. Tulane’s Department of Biomedical Engineering, founded in 1977, has an ABET accredited undergraduate program with 200 undergraduate students and 50 graduate students. BME is administratively located in the School of Science and Engineering on Tulane’s uptown campus. Biomedical engineering research is enhanced by co-location of its research facilities on the downtown Health Sciences campus. Tulane University, an Equal Opportunity Employer, believes that students learn best in a diverse, inclusive community and is therefore committed to academic excellence through diversity in its faculty, staff, and students. We encourage applications from members of groups that have been historically underrepresented in higher education. Applicants must have a Ph.D. in biomedical engineering or a related field, have evidence of excellence in research and dedication to teaching and mentoring. Successful candidates will be expected to develop an internationally recognized and externally funded research program, and initiate interdisciplinary and collaborative research. Applications must be received by January 1, 2019 to receive priority consideration, though the search will remain open until the position is filled. Inquiries may be sent to bmen-info@tulane.edu. Interested parties should apply with a letter of interest, a research statement, a teaching statement, a curriculum vitae and names of references at apply.interfolio.com/55403.